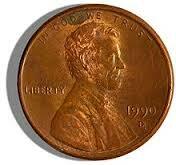 I will always pick up a penny I see one on the ground. Always. I simply can’t risk not picking one up. I’ve always considered the possibility that the phrase find a penny; pick it up; all day long you’ll have good luck might be true. Anything that has the potential to bring good luck always me smile. Posted on January 31, 2014, in Family, My life, perspective and tagged 365 reasons to smile, childhood, life, luck, musings, smiles, Thoughts. Bookmark the permalink. 22 Comments.